It was built on the former tomb of St. John the evangelist, one of Bible authors, during the Byzantine period according to cross plan by emperor Justinien I between 532-537 AD. 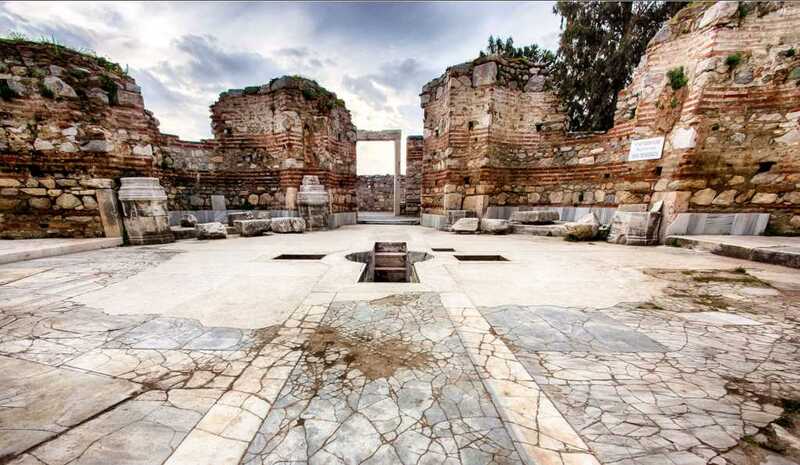 The church building has served as the church of Ephesus till the Selçuk town was seiged by the Arabic troops in 10th C AD.Today it is one of the most visited places in the area of Kusadasi for both cruise clients and holiday makers. Three popes from Vatican city had been and prayed in the ruins of the church so far. Excavations are still going on under the supervisor of Turkish government. It is the most beautiful Byzantine monument in this area. It is located in down town of Selcuk on the footstep of Ayasuluk castle. The location is very near in the center and it is available to reach on foot in 10 minutes on the way to Izmir road. It takes about 30 minutes from Kusadası port, about an hour from Izmir airport. While John the evangelist was staying in his grotto, one day he suddenly heard a sound coming behind him like a thunder. The sound said, “ I am alfa and omega. Write what you have seen on a scroll and send it to Ephesus, Smryna, Pergamon, Sardis, Thyatira, Philadelphia and Laodecia. “He was the first and the last so He was God. Later John was dictated to write Gospel. 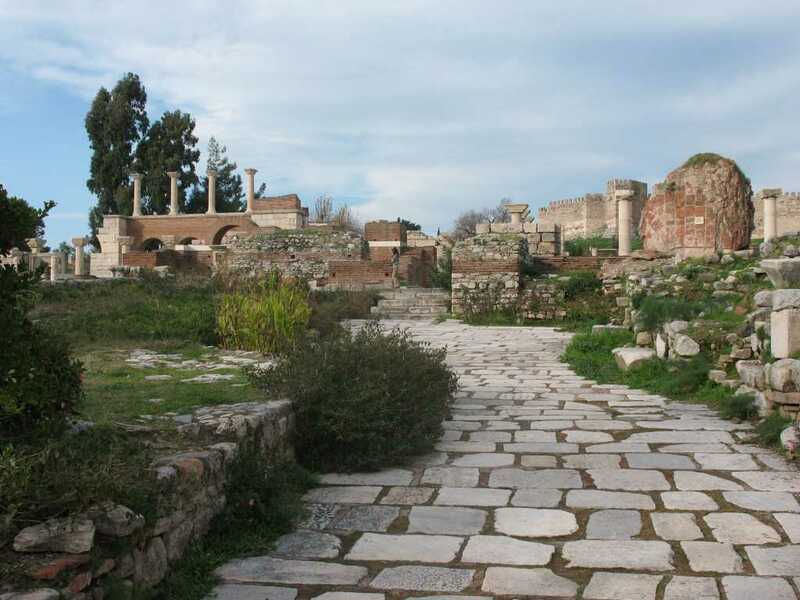 When he was freed after the emperor Domitianus had been assasined in Rome, he came to Ephesus and was able to complete his book in this city. John also heard that St. Paul was martyred in Rome so he became the head of the followers of Jesus and he taught how the people got baptised. He also had a big fight to Diana temple and visited seven churches of the Revelation and gave the letters to them as the warnings of God. In one speculation, St. John passed away at the age 127 at the end of the 1st C AD and he was buried on Ayasuluk hill. 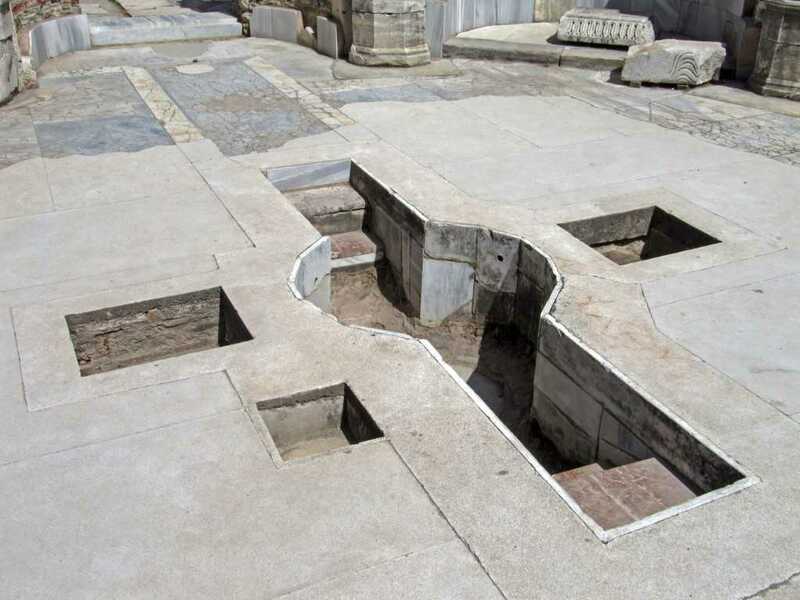 Till the Christianity legalised by Constantine the Great in 330 AD, his tomb place was only known by church elders not to be destroyed and kept secret from generation to generation. 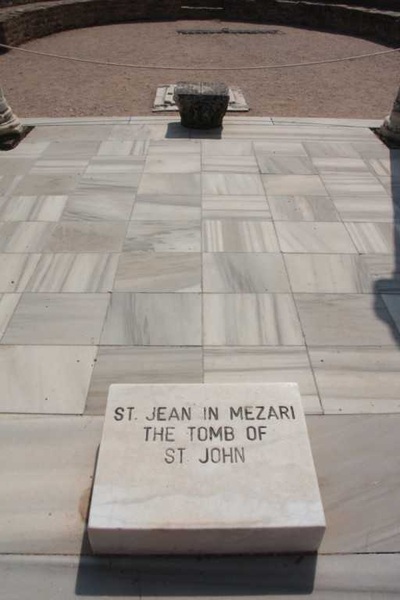 In 400 AD, a stone church was built with wooden top on the former tomb of John. 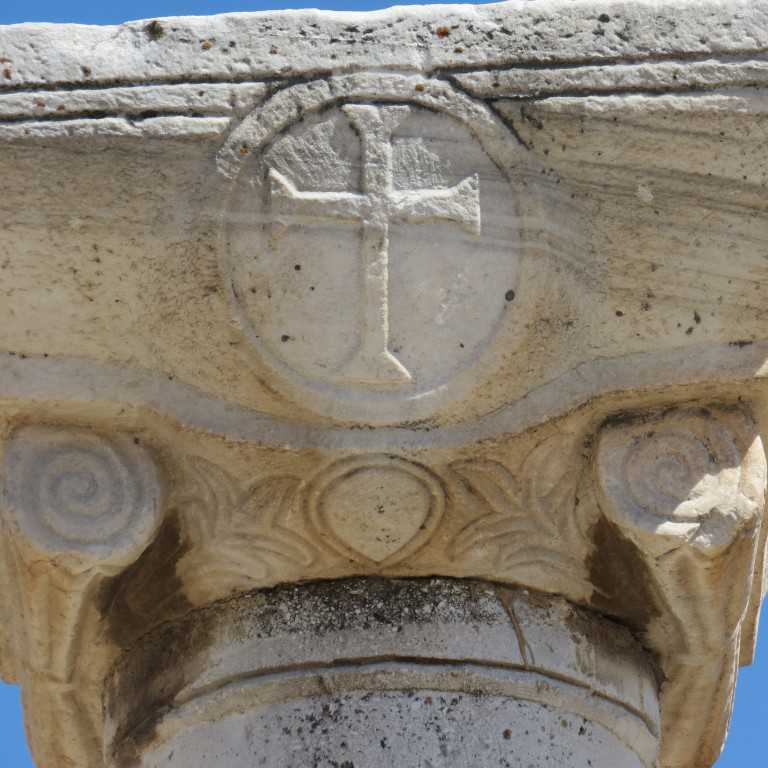 Later in 537 AD, Byzantine emperor Justinien added a big basilica on the cross shape with 5 domes. The construction was walled by the castle in order to prevent Arap raids in 9th C AD. 11 th C AD Selçuk Turks took over the town and the church was left in ruins at the end of that century. In 1390 the town and the church were taken over by the Selçuk Turks whom they established a great empire before Ottomans here. In the beginning of 20th C AD, The excavations began and American firm from Ohia called George Quatman foundation became the sponsor for diggings in 1960s. The church is considered as holy so it was visited by Pope John Paul the VI in 1967, Pope John Paul II in 1995 and John Benedictus in 2007. The present pope is expected to pay a visit soon. The church is still being excavated by archeologists today. Today a visitor can see a nartex ( outer courtyard ), a treasure hall, an atrium, a syntrenom,a chapel, the tomb of John under the main dome , Maltese columns with curved crosses and a lovely baptismal pool. 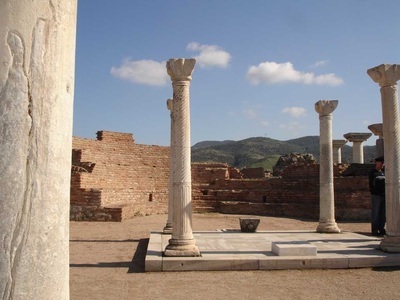 It is believed that the church of John in Ephesus as holy place for Christian believers so it has become one of the main pilgrimage centers on the way to Jarusselam since medieval times.